The inn is almost full for the Central Oregon Nordic Club’s annual winter trip to Methow Valley in northern Washington, set this winter for Feb. 3 to 8. Joanne began accepting deposit checks in June. As in the past, the cost will include five nights of accommodations, all meals, taxes and gratuities. However, transportation to Mazama, Wash., and trail passes are not included. Roughly 30 club members went to the skiing mecca last January to ski groomed trails that meander through large open meadows with rugged mountains on both sides of the valley. 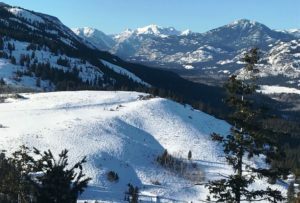 Methow Valley has some 200 kilometers of trails groomed for both classic and skate skiing, and some club members also went snowshoeing. 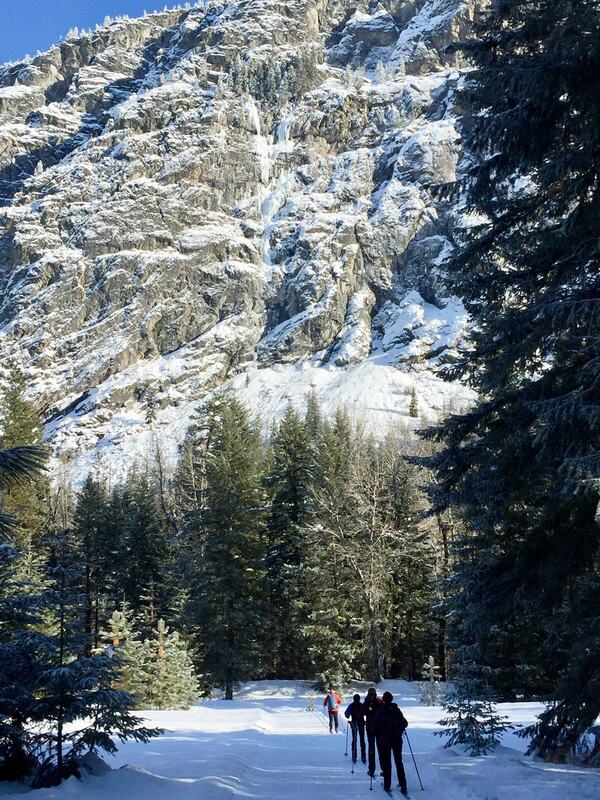 Most of the daily outings began right out the front door of the Mazama Country Inn. Aspen Room — located on the first floor of the main building. One queen bed. Ideal for a single person or cozy for two people sharing one bed. Birch Room — located on the second floor of the main building. One queen bed located in the loft and a small bed located under the stairway to the loft. Dogwood Room — located outside the main building but reached by a covered walkway. One queen bed, fireplace and private deck. The Dogwood and Evergreen rooms are much larger than rooms in the main building. Evergreen room – also located outside the main building but reached by a covered walkway. One king bed, queen sleeper sofa, fireplace, etc. The rates are based on double occupancy in all rooms but rates are available for single or triple occupancy. Check room descriptions at www.mazamacountryinn.com. Aspen — single occupancy, $1,036.80. Aspen — double occupancy, $678.65 per person. Birch — double occupancy, $692.43 per person. Dogwood — double occupancy, $802.63 per person. Evergreen – double occupancy, $843.95 per person. A completed overnight trip application (located under “helpful links” on home page) is required, as well as current membership in CONC. Please contact Joanne at joanned@bendbroadband.com after Oct. 15 for more information. Or, send a deposit of $150 per person payable to Joanne Dalsass, LLC to 630 NW Roanoke Ave.; Bend OR, 97703. Please include your room choice.